Yes, I'm waiting to see the results of this too. Is this going to be one of those early/cheaper mods to get some decent gains or will it be for someone chasing HP and track times ??? Top quality fit out compared to some of the USA made ones..the yanks have been running these on their lsa's for years..! Obviously not many on here follow any of the USA forums...! LSA lid spacers have started shipping out this week we have had quite a large response. For those asking about dyno results we will be doing a back to back very soon. Be fantastic to see the dyno comparison results. One could imagine the outcome will be variable, depending on the boost pressure the engine is producing??? I understand why but I don't think this would be most people's first modification. You'd get better bang for buck with other options. Not knocking the product, I just think most people would do an intake, more boost etc before this option. Whilst it will likely still have some improvements, the gain will be more noticeable when the blower is working harder. I'm also interested in test results. Have you also looked at how much the manifold volume is increasing? I ***ume from a % perspective probably not a great deal? We've managed to booked in some dyno time for this weekend, using NickGTS's car it's it medium/high HP car still stock LSA cam and stock LSA heads so dyno numbers are going to be relative to most people. My personal opinion is that this will make a HP gain more on higher HP cars but also on a stock LSA's for 2 reasons, 1 colder intake temps, 2 more air flow. 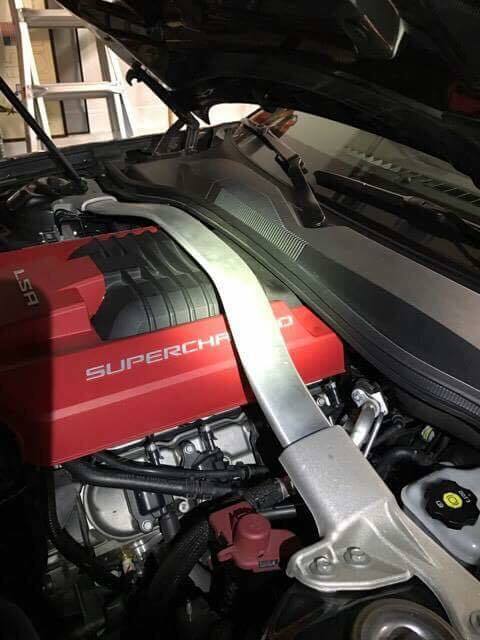 Basically it's been brought to my attention from our US customers with the ZL1 Camaro that the rear "curve" in the LSA supercharger lid is because of the camaro's engine bay, there is zero room back there and they have had to shape the rear of the lid to make it fit, there is literally threads online asking how to remove the rear charger bolts as they cannot get to them, the procedure is to drop the engine down or drill ****s in the panel, hence why the CTS-V has a different lid without such a sharp curve as it has more real estate. Our VE/VF has buck loads of room so this is a non issue for us guys. Being we get the hand me downs here for the HSV this "curve" in the lid has not been altered and we have a major lack of airflow to the rear cylinders. Admittedly we never picked up on this lack of air flow as we were looking at lid/blower surfaces to design the plate for colder IAT's not until we test fitted it to a car we then found an oil trace on the lid itself going to the rear cylinders on both sides of the lid and runners, all other cylinders and runners were clean, this proves that the other cylinders have lots of air flow and the oil is being cleaned/scrapped away from sheer air volume and velocity. Then visually looking at the lid you can clearly see it's squashed way too much and basically this "curve" is not needed on our cars. Along with the benefit of also having colder IAT's combined. When NickGTS tested at the track without any tune changes at all it was showing 1-1.5mph, his IAT logs also showed colder intake temps throughout the p***. You can again see in this picture how restricted the rear cylinders are. End of the day the spacer does 3 major things colder IAT's and more air flow from the blower discharge going through the entire surface of the brick and more air to all cylinders. 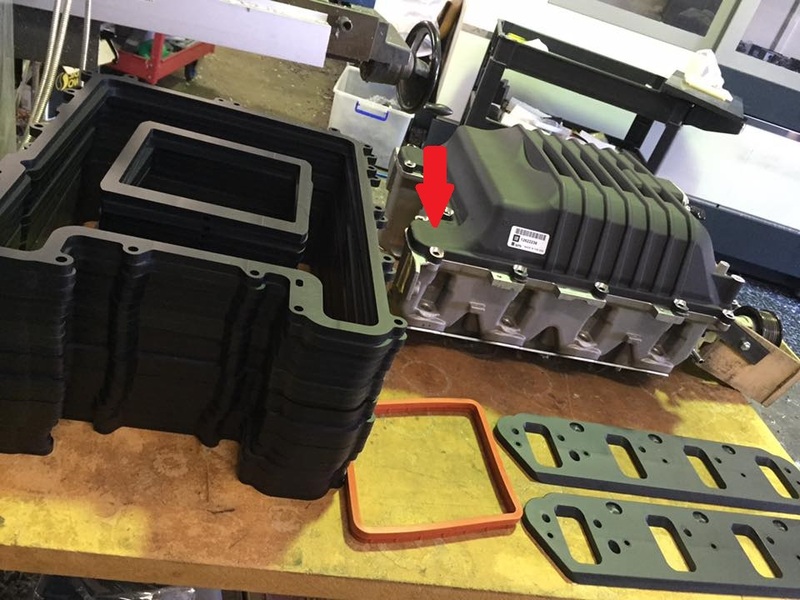 This is the ZL1 engine bay and the reason why the lid is so squashed with the "curve". Last edited by GenF-GTS; 15-02-2017 at 02:24 PM.